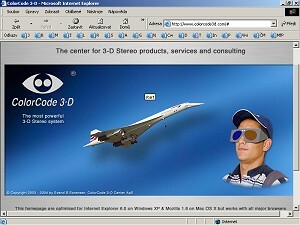 The new technology was named ColorCode 3D. If you want to know the basic principle then we can describe it this way: ColorCode 3D uses 3D glasses with 2 different colors (like anaglyph) - one is dark blue and the second yellow (which is created as combination of the red and green colors). The pictures are created quite like anaglyphs - the blue component for one side view is blended with the red/green component for the second side view. ColorCode 3D is patented. And the patent contains a lot of improvements. Creating of 3D pictures is mathematicaly more complicated than described above, but the basic princip is as described. We've decided to test the ColorCode 3D technology. We've watched a lot of images and used the graphic editor to a lot of experiments. And we can say that the images are very good. Thanks to the selected colors and used mathematical algorithms you can see very true colors in ColorCode 3D pictures. Through the yellow "glas" you can see almost all the colors, dark blue "glas" seems to let through mainly the brightness. The 3D effect is very good as well. But it's necessary to say that there is a lot of methods to improve 3D effects for anaglyph as well - for example when are used big areas of "inappropriate" colors. But ColorCode 3D uses these methods as a standard. There are not only advantages. The main disadvantage of ColorCode 3D is: It's not widely used. If you create your photos in ColorCode 3D and place it on the web then only a few people can see the 3D effect - because only a few people have the appropriate glasses. Anaglyph glasses are used much more often. 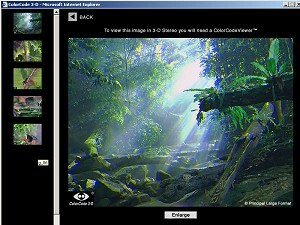 New version of 3DJournal software supports blue-yellow anaglyph. And one more thing - the link to ColorCode 3D pages - right here . (You can find this link on our link page as well - on this page we update the link if necessary). You can find here not only informations about the technology but a few of image galleries as well.